Murata announce the sampling of the world’s first common mode choke coil designed to be fully compatible with the automotive high-speed (1Gbps) LAN standard, 1000BASE-T1. The new DLW32MH101XT2 is the industry’s smallest common mode choke coil for 1000BASE-T1 applications. Vehicle technology has rapidly evolved in recent years to include advanced driver assistance systems (ADAS) and sophisticated in-vehicle infotainment (IVI) while moving ever closer to fully autonomous operation. As a result, vehicle communication busses carry increased-bandwidth data from higher resolution image sensors and more complex electronic control units (ECUs). To support this traffic, the 1000BASE-T1 standard is expected to become widespread in the future. The DLW32MH101XT2 supports the S-Parameter characteristics specified by the OPEN alliance automotive network standard organization and meets the characteristics for noise filters in 1000BASE-T1 communications. 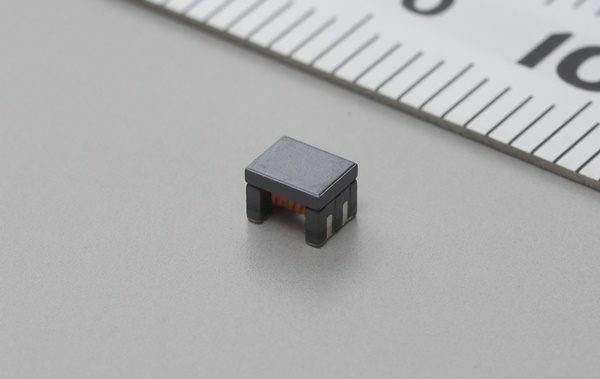 Through the application of Murata’s winding technology and using a unique winding structure, the device is the smallest currently available, measuring just 3.2 x 2.5 mm x 2.5 mm and weighing just 0.064 g. It offers an inductance value of 100 uH and a typical DC resistance of 2.6 Ohm and is rated for currents up to 100 mA. Compliant with the AEC-Q200 automotive standard, the common mode choke coil offers an extended temperature range of -40 °C to +125 °C, making it ideal for demanding automotive applications.